In general, only men who own small dogs or take Pilates drink fruit-flavored liquors. But there is an exception: men who drink infused tequila either straight or on the rocks. 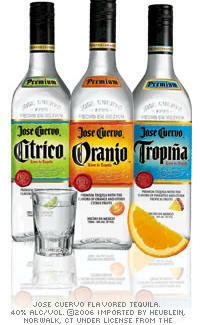 Cuervo Tropiña: One taste of this pineapple-tinged tequila and you'll climb a telephone pole in search of a coconut. Cuervo Citrico: With the lime already mixed in, all you'll need is a glass. Though Citrico's so refreshingly zesty, you would cheerfully drink it from a boot. Cuervo Oranjo: Oranjo will not give you that extra boost of vitamin C your body needs, but its deliciousness will make scurvy more tolerable. And if you happen to be a mixologist by nature (and there's nothing wrong with that), go to Cuervo.com and check out some of their 80 Proof recipes. And if anybody gives you crap about drinking a fruit-flavored cocktail, just tell them "Back off -- this drink's made with tequila. Now, get your foot off my dog."